Current Bolivian anarchical ochlocracy in power is relentless! 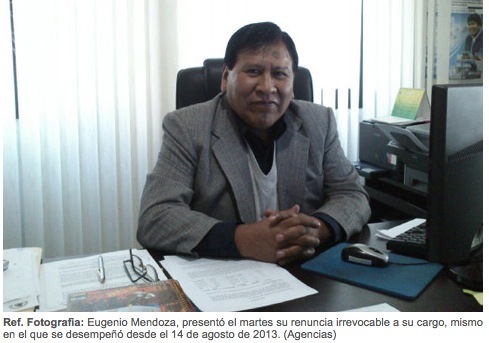 Eugenio Mendoza, submitted his irrevocable resignation from office, the same in which he held since August 14, 2013. Vice Minister of Mining Policy, Regulation and Enforcement, Eugenio Mendoza, resigned on Tuesday 12, after having declared at the start of this week, the losses of Huanuni Mining Company, in the first half of this year, reached two million, citing the reason for that being low production. “I regret that statements poured (Monday 11) in an impromptu press conference, that they have been considered offensive by the Mineworkers Union of Workers of Huanuni” said the former authority in his resignation letter sent to the Minister of Mines, César Navarro, in which states that the press questions were directed to bankruptcy in which the state company would be, the wages of workers and if they would suffer personnel reduction. Mendoza said the answers he gave to reporters Monday at the Ministry of Mining facilities were “technical” and dismissed the bankruptcy of Huanuni. “Moreover, I expressed that Huanuni should improve their production levels and that the government, through a loan of $45 million dollars, will allow the company to increase its production,” the former authority stated in his official note. The now former vice-minister Navarro told the minister his resignation due to the request of the Federation of Mine Workers of Bolivia and Huanuni Mineworkers Union of Workers and the Central Obrera Boliviana and Oruro Departmental Workers joined. And … so goes the relentless anarchical and ochlocratic ruling of the now president of Bolivia, who functions first as the coca-growers’ leader of the Chapare… the infamous “governing from the streets” is damaging the meritocracy, the purpose of having competent, reliable, objetive people in charge of the government of Bolivia. Huanuni has suffered the loss of 16 people back in 2006, when this government let the miners from the coops fight to death against the miners of Comibol, the state-owned enterprise… since both sectors gave support of this populist ochlocracy, no order was restored and still remember that current and now running for the illegitimate re-re-election VP, only offered the coffins! This entry was posted in Bolivia, Business, Economics, Mining, Politics, Social Unrest and tagged bad politics, demagogue, Ochlocracy, Oruro, public policy failures. Bookmark the permalink.